Our hands are perhaps the busiest part of our bodies & this can cause severe RSI (repetitive Strain Injury) CTS (carpal tunnel syndrome), or sometimes even “trigger finger”. Our Blissful hand massage helps to ease pain soothes the muscles. Hand Reflexology is good for headaches, neck or back pain & improved circulation. This is indulgence at its best!! Our hands are essential and very important when it comes to touching, sensing and communicating with others, and this is why they have an extremely powerful role in the healing process, and just about doing everything. Hand massage or hand reflexology is a very simple yet effective therapy that most clients find therapeutic and deeply relaxing. Our hands, just like our feet, face and ears, have many acupressure and reflexology points, which are associated with our organs & certain parts of our body, and generally, hands are much easier to reach and work on, especially since some people might have ticklish, or may not like their feet being touched, or just generally uncomfortable with feet being touched . There are many acupressure and reflexology points in these limbs which pertain to vital internal organs and other parts of the body. 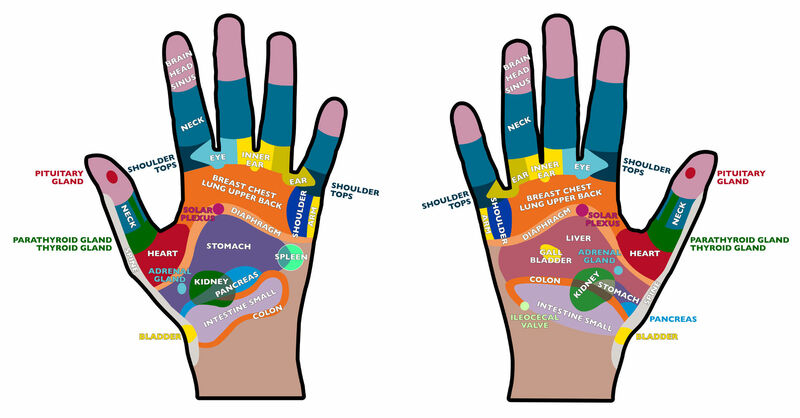 So, because our hands are full of pressure points and receptors, they respond very well to massage, and by massaging these areas on the hands, this can improve circulation to the corresponding body part or organ and relieve tension. The hand massage also provide curative effects for poor blood circulation, arthritis, headaches, neck and shoulder pains, backache, digestive, reproductive problems, and so on. Furthermore, it can be safely applied to people of all ages and genders; infants, young children, teens, adults and the elderly, and can help the body to achieve relief from stress, anxiety, nervousness and headaches very quickly. The most common forms of arthritis in the hand are osteoarthritis and rheumatoid arthritis and this can be very debilitating. Pain in general limits everyday activities such as dressing, carrying, and holding etc. Improving circulation in the hand is very important if one has RSI or CTS, or following surgery, or after an injury, such as ligament sprains and muscle strains. Improved circulation to the injured tissues helps to speed up healing by bringing more nutrients to the area of injury and removing the harmful metabolic by- products that tend to accumulate in the tissues following trauma, injured foot. A medical condition called “trigger finger” is a condition, which occurs more frequently in women than men, it is tendon-related and can lead to a finger being locked in the outstretched, pointed position. A hand massage can help to “unload” the trigger finger condition. Usually sufferers can be between the ages of 40 and 60, and might often have the associated conditions of diabetes and-or arthritis. Sometimes massaging the fleshy part between the thumb and forefinger, and the top of the thumb can help provide general headache relief. The tops of each finger, excluding the thumb, might give some relief from sinus headaches, and the sides and base of each finger can relax a tense neck and shoulders, which is a common cause of headaches. Better and enhanced circulation: Improved circulation is one of the most important health benefits of hand and arm massage therapy. Effectively stimulating circulation in the hands is important, especially if one suffers from a condition such as Raynaud’s phenomenon—a painful condition of the fingers, toes and other areas. This condition is believed to be caused by a sharp and persistent contraction of a blood vessel, causing a marked reduction in blood flow to the fingers. Benefit conditions that typically affect the hands and wrists, including arthritis, carpal tunnel syndrome, Trigger points, and repetitive strain injury (RSI). Better range of motion – improved finger and wrist range of motion. Help maintain manual dexterity- better skill and control and flexibility of the hands. Through massaging the hands and arms, overused and tired hands are rejuvenated.